The Texas State Bison Herd roams the prairie at Caprock Canyons with a heritage that echoes across the Plains. The mission was this: Find the last remaining native wild bison in Texas. For decades, the herd had been roaming the Panhandle’s sprawling JA Ranch after a handful of its ancestors were set aside by legendary rancher Charles Goodnight during the great slaughter of the late 1800s. The herd had a place in history: The Goodnight/JA herd played a key role in the recovery of bison from the brink of extinction, and the animals were believed to be the last remnants of the great southern plains bison herd. In 1994, the state was considering taking over the herd, and then-Texas Parks and Wildlife Executive Director Andrew Sansom wanted to see what he might be getting into. Problem was, the JA Ranch, which once covered more than a million acres, wasn’t exactly sure where the bison were. That day in the Panhandle, the bison thundered across the plains just as bison had done for generations in great herds across the continent as the keystone species of the prairie. TPWD decided those animals were worth protecting, and the JA Ranch donated them to the state in 1996. 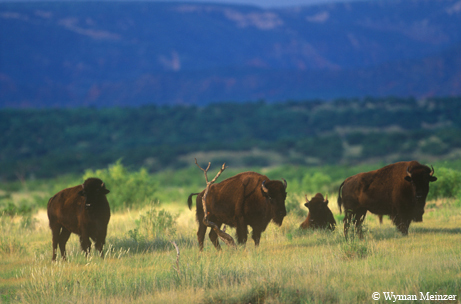 Those Panhandle bison became the Texas State Bison Herd, living at Caprock Canyons State Park. Now the 79-animal herd is undergoing dramatic changes. The state park has more than doubled the amount of territory devoted to the animals — a welcome development for the bison and a development that will allow visitors greater opportunities to see the animals. And, a breeding project undertaken to bring more genetic diversity to the herd and ensure its survival is reaching a crucial stage in its development. From his seat in the plane, Sansom saw what we all see in bison: an icon of the West, America’s largest land mammal, a symbol of near-extinction and recovery, a relic from a time of wide-open spaces and a reminder of a time when America was full of great, wild creatures. In North America’s history, there’s been perhaps no more important wildlife species than the bison. And Goodnight’s herd was once one of America’s best-known bison herds. Members of the Panhandle herd and their ancestors are part of the larger story of all North American bison, commonly called buffalo. However, their historical affiliations, their connection to Texas and their genetic makeup set them apart from other U.S. herds. Survival of bison was on Goodnight’s mind when he captured a couple of bison calves in 1878 at the urging of his wife, Mary. The bison slaughter had wiped out the great Texas herds, and Mary Goodnight, saddened by the killing of the animals, wanted her husband to save a few before they were gone. “He thought bison were interesting, but I think Mary was the passion, the heart and soul, behind the need to save those animals,” says Vicki Sybert, interpretive specialist for TPWD in Lubbock and Goodnight herd historian. Just two years before, in 1876, Goodnight had driven a herd of cattle down into Palo Duro Canyon to establish what would become the JA Ranch with partner John Adair. Goodnight had to shoo thousands of bison out of the canyon to make room for his cattle. By 1878, he no longer had to chase the bison off. The buffalo hunters had taken care of that. Goodnight was an iconic Texas figure. He established the Goodnight-Loving cattle trail and was a pioneer in cattle breeding. He invented the chuck wagon. In establishing the JA Ranch, he became the Panhandle’s first rancher. And he was a pioneer in bison conservation. After roping those first calves and acquiring a few others, he set about raising a bison herd in addition to his cattle operation. His initial herd of five to seven animals grew to 13 animals by 1887 and reached a peak of more than 200 animals in the 1920s. The timely formation of Goodnight’s herd and the formation of four other private herds, along with government protection of a wild herd at Yellowstone National Park, saved the species from extinction. Those few herds provided the founding stock that produced nearly all plains bison in existence today. Goodnight donated or sold bison to several early bison conservation efforts, such as those at Yellowstone, the National Bison Range and Canada’s national parks. He sold animals to numerous other parks, private individuals and zoos, including “Buffalo Bill” Cody and the New York Zoological Park, which was instrumental in establishing the first U.S. bison preserves. Goodnight’s efforts also ensured preservation of animals from Texas and the vast southern plains bison herd, which covered Texas, Oklahoma and part of Kansas and was split from the northern herd by the transcontinental railroad in the mid-1800s. Most U.S. herds have been mixed and moved, but Goodnight’s has stayed on its original range. Goodnight left the JA Ranch in 1887 and established his own ranch near the JA. Goodnight died in 1929, and he wanted the state to take over his ranch and bison herd. Everything seemed to be moving toward state ownership of the herd: The state game commission supported the purchase and had the money to buy the animals, and the Texas Legislature gave the game commission authorization to buy the herd, provided that a suitable home could be found. It never happened. Goodnight’s ranch — and his bison herd — changed hands several times. Efforts to kill the herd in a “last great buffalo hunt” were halted after public outcry. The bison occasionally escaped into Palo Duro Canyon, and they eventually were allowed to stay on the JA Ranch, where they remained for decades in relative obscurity. Things started to change in 1994 when TPWD received an urgent and unexpected message from Germany. 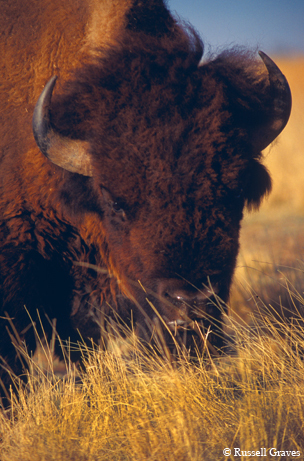 German conservationist Wolfgang Frey, who had an interest in American bison, thought the JA herd might represent one of the last “pure” bison herds in the United States. Frey’s urgings piqued the interest of TPWD officials, but it wasn’t until months later, when the owners of the JA Ranch approached them and started talks about the herd, that “it suddenly became a really exciting project,” says Sansom, who is coming out with a book on southern plains bison and the Caprock herd with photographer Wyman Meinzer. The JA owners agreed to donate this distinct and historic herd to TPWD, and the agreement set in motion one of the largest and most complex projects undertaken by the department. Just how do you capture and transport a few dozen wild bison? The department hadn’t done anything like this before. Capture and relocation efforts began in 1997 after Caprock Canyons was selected as the site for the herd. Capture pens were built on the JA Ranch, and, simultaneously, a 320-acre enclosure at Caprock was fenced. 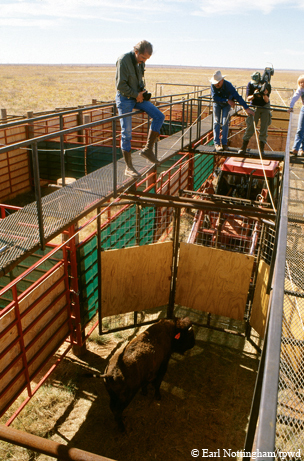 In often cold, harsh conditions over three months in the winter of 1997-98, the wild bison were darted, rolled onto metal skids, loaded onto trailers, taken to the JA pens, assessed and then taken to Caprock Canyons. The State of Texas was now the proud owner of a 36-head bison herd. The recovery of bison from the brink of extinction is one of the best-known conservation stories. More than 450,000 plains bison exist in North America, a remarkable comeback from a low of a few hundred animals in the late 1800s. But the fate of the wild bison is far from secure. Ninety-five percent of today’s bison are in commercial herds — meaning only 5 percent are in conservation herds, which are those managed by federal and state governments and conservation groups primarily for conservation purposes. Those in commercial herds are raised mainly for meat production, with pressures pushing them away from their wild origins. For the Texas herd, genetic tests, in addition to confirming the herd’s unique DNA, uncovered something troubling. Researchers from Texas A&M University, led by James Derr of the College of Veterinary Medicine, found that the Texas herd had low genetic diversity and was suffering the effects of inbreeding. An A&M analysis revealed that the herd had a 99 percent chance of dying off in 50 years. In 2003, TPWD brought in bulls from another herd to inject some genetic variability and ensure a more stable future. Three bison bulls were chosen from a New Mexico herd owned by media mogul Ted Turner, the largest single owner of American bison. Goodnight and Turner — in bison terms, this was a celebrity marriage. But it wasn’t an easy decision. TPWD and A&M officials didn’t want to dilute the historical importance of the herd by bringing in outside genes. They didn’t want to see the herd die off, either. TPWD and A&M officials sought outside bison that had high levels of genetic variation, were free of disease, had no evidence of cattle genes and, if possible, had some connection to the Goodnight herd. The Yellowstone herd was an ideal candidate — 100 years after Goodnight sent three bison to Yellowstone, three animals could return to the Goodnight herd — except that members of the Yellowstone herd are known to have brucellosis. TPWD officials found what they wanted with the Turner animals, which are partially derived from Yellowstone stock. That’s what A&M researchers are currently trying to determine. At Caprock Canyons, the bison now have more room to roam, with more than twice as much territory as before. The herd, which doubled in size under the watchful guidance of the Wildlife Division, was transferred to the State Parks Division last year to give the bison additional room and provide visitors a better chance to see the animals. Now the herd has 500 acres of new territory in addition to the more than 300 acres it already had. As time and money allow, the bison territory will be expanded to cover more of Caprock Canyons, which was once part of the JA Ranch. TPWD’s goal is to establish the herd in a natural ecosystem setting with other native animals and plants. Donald Beard, Caprock Canyons superintendent, gave me a preview tour of the new bison habitat last fall. The original bison pasture at the park offered limited viewing opportunities, and Beard says the new territory will put the bison where the people are. “You are now in the bison territory,” Beard told me as we drove through the restored prairie at the front of the park. He says park staff will be vigilant about monitoring the bison and will take an active role in informing visitors about the animals. We drove by Beard’s house, which is in the bison territory near Lake Theo. Lake Theo has its own piece of bison history. It’s the site of an ancient bison kill, where people butchered and processed bison thousands of years ago. At the lake, scientists have recovered bison bones and tools that are 10,000 years old. C.L. Hawkins, a longtime Caprock Canyons employee, has been the main caretaker of the bison since they arrived from the JA, and he took me out into the original bison pasture in his pickup. The bison know it’s Hawkins coming, and they approach the pickup. Pretty soon, we’re surrounded by the Texas State Bison Herd. Hawkins’ appreciation for the animals is evident. To him, the cultural, historical and genetic significance of the animals makes them something to be treasured. “There are no other animals like this anywhere,” he says. Hawkins then took me to the working pens, where TPWD staff rounds up the bison every December to vaccinate them and perform a health checkup. The designs of the chutes and pens were overseen by Colorado State University professor Temple Grandin, who uses her experiences with autism to guide her designs of stress-reducing animal handling facilities and who was the subject of the 2010 Texas-filmed, Emmy-winning HBO movie Temple Grandin. In December, the grandchildren of the Turner bulls were rounded up for the first time for evaluation, and TPWD officials and A&M researchers are eager to see what the genetic results will show. In the meantime, members of the herd will be exploring their new home on the prairie at Caprock Canyons, where Texans will have more opportunities to see and appreciate them — a herd that represents all that’s left from the great thundering herds of the southern plains, a herd that’s a living reminder of a Texas gone by.